Whether your goal is to save money on utility bills or increase your property value, solar panels are a worthy investment for your home. Finding a reliable and trustworthy solar installer is your first step in powering your home with solar energy. 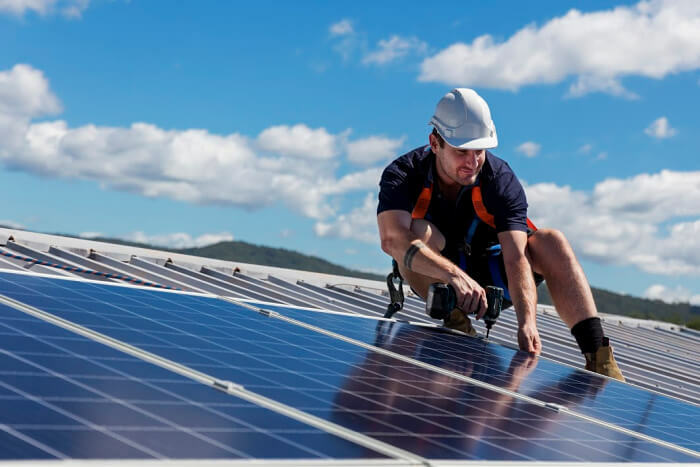 A knowledgeable contractor will help guide you through the process and ensure that you maximize both the immediate benefits of and future return on your solar panel installation. Investing in residential solar panels is usually prompted by a desire to save on utility bills or increase the value of a home. Before beginning your project, you will want to research local and federal rebates, incentives and technologies, and the quality and longevity of solar panels. You will also need to have a good understanding of the benefits of solar power systems and the realistic return on your investment. That’s why you’ll want to find a contractor you can trust—a local professional who can get the job done and assist you with navigating local policy and regulation. Connect with trusted solar panel installation contractors in your area with Modernize. A recent Modernize survey showed 63 percent of homeowners feel most confident with their project when comparing multiple project quotes. How much experience do you have with solar panel installation or incentives? After obtaining three or four written estimates and vetting each of your potential contractors, you are ready to explore payment options. If you are not planning to pay for the project out of pocket, you may want to consider financing it. Two-thirds of the homeowners we recently interviewed about solar paneling projects shared they took out loans to cover them. Your project quotes will guide the cost of your installation and will be necessary for determining an accurate loan application. Connect and compare trusted solar installation contractors near you. Unfortunately, there is a small percentage of contractors who are not honest professionals. Many of these contractors promise benefits with offers that boast inflated future savings and unrealistic increases to home value. The best way to avoid scams is to choose a local, trusted solar installer. You can confirm this by checking their physical business address and validating their licensing. Be wary of any outliers in your quotes. All estimates should be relatively similar unless the material type is significantly different, as might be the case with the components of solar roof panels. At the final meeting, there a few steps to go over before the solar installer begins your project. The Modernize Contractor Checklist will help you vet a trusted contractor, so you can relax knowing your solar panel project is in good hands. You can access the interactive checklist by visiting the Modernize Homeowner Portal or by downloading it here.